This unit offers genomics and informatics services to cater to the needs of genotyping and sequencing for a range of applications in different themes of the global research program on Genetic gains, other Research Programs, and NARS partners. An arm of the Center of Excellence in Genomics & Systems Biology, provides services on a cost-to-cost basis with the objective of enhancing genomics applications in breeding as well as research at ICRISAT and its partner institutes. 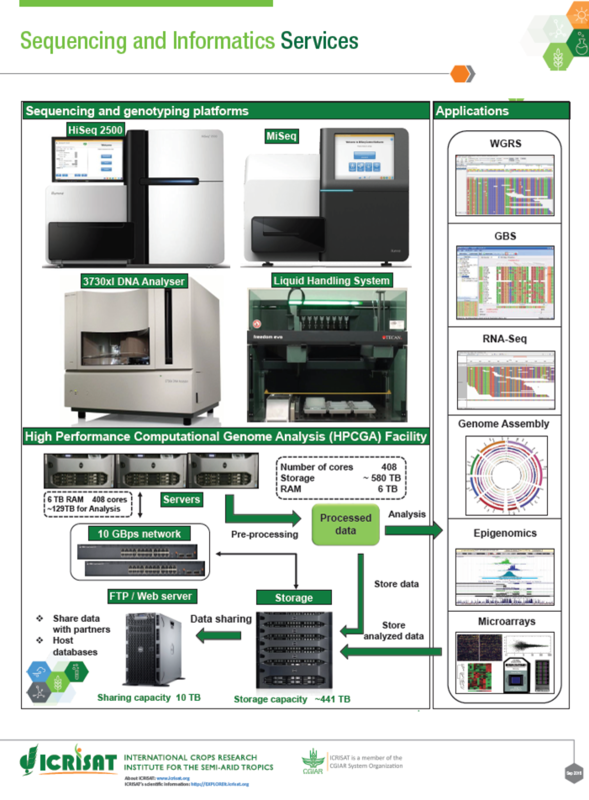 The CEGSB hosts state-of-the-art genomics platforms such as HiSeq 2500, MiSeq, ABI3730, Microarray Spotter & Scanner, LiCOR, etc. and ahigh-performance computational analysis platform with 600 cores, 6 TB RAM and 830 TB storage. Training in sequencing and genotyping data analysis.